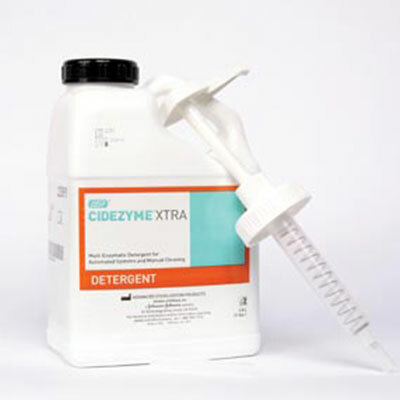 J&J/Asp Cidex Gi Enzymatic Detergent Solution 22591 is uniquely formulated for the cleaning cycle in ASP’s Evotech ECR and automated endoscope reprocessors. It is biodegradable, inhibits rust, and is uniquely formulated with multiple enzymes to provide faster, more thorough penetration to effectively remove bioburden. Glutaraldehyde-free (0.55% ortho-phthalaldehyde) high-level disinfecting solution. Rapid 5-minute soak time at 25°C in an automated endoscope reprocessor. Twelve-minute soak time 20°C for manual reprocessing. No activating or mixing needed. Minimizes exposure to fumes, odor or irritation. Long-lasting efficacy allows reprocessing of more devices per gallon than with Glutaraldehyde.